The Mulga Parrot (Psephotus Varius) is usually seen flying swiftly close to the ground with a slightly undulating flight. They fan out their tails when they land. The males are more brightly coloured (bright green with patches of red and yellow) than the females (olive-green with duller patches). Mulga Parrots are a lot quieter than many other species of parrot and they do not form large flocks, but travel in pairs or small family groups. Their green plumage blends remarkably well with the foliage, which allows them to sit quietly in a tree during the hottest part of the day without being easily seen by predators. Mulga Parrots are found in arid and semi-arid, lightly timbered country, including Mulga and Mallee woodlands and in areas of saltbush. They live across central and southern Australia from west to east, but are less common near the coast. Mulga Parrots are moderately common; can become abundant in good seasons, but at other times become scarce. Seeds from grasses, herbs and shrubs, and berries, are the main diet of the Mulga Parrots. Mulga Parrots spend a large amount of time foraging for seeds on the ground which makes them vulnerable to predators such as the feral cat and the fox. Seeds do not contain much moisture, so Mulga Parrots need to drink regularly from a nearby water source. 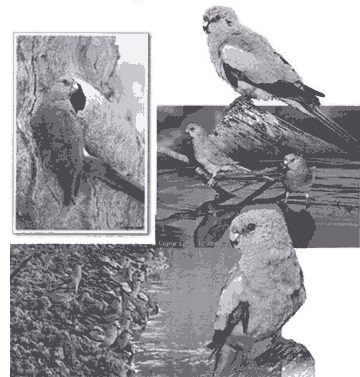 This makes them vulnerable to aerial predators such as falcons and goshawks who often hunt around waterholes. Mulga Parrot chicks are also vulnerable to predation in their small tree hollows from medium sized goannas (monitor lizards). Mulga Parrots spend a lot of time resting in the shade of a tree during the hottest part of the day and are often found in "Mulga" woodlands (Mulga is a species of Acacia - Acacia Aneura, which presumbably is why the common name of these parrots is such). They are also at home on the ground while feeding but if disturbed will fly into a tree and wait for the danger to pass. During the breeding season they nest in small tree hollows. Breeding is usually influenced by rainfall. They nest in the bigger trees found along water courses. Nests are usually in a small, deep hollow, in a branch 3-4m high. In treeless, very arid environments, they have been known to nest in earth banks. The 4-5 rounded white eggs (24 x 19mm) are incubated by the female and the chicks hatch in 18-20 days. She is attended at the nest by the mate. The young birds fledge at 4-5 weeks. The scientific name of the Mulga Parrot is Psephotus Varius. The word 'Psephotus' means 'inlaid with small pebbles', referring to the mosaic-like cheek feathers of these small parrots.